As Highly Sensitive Empaths, we experience more emotions than the average person. When emotions are allowed to be felt and released, energy flows freely. When emotions are blocked or suppressed, they block the flow of vital energy. We block emotions by habit or instinctual response. Learned habits come from our early childhood. As children we’re often shut down when expressing emotions. “Don’t cry or I’ll give you something to cry about.” “Big boys/girls don’t cry.” “Don’t be sad, you’ll make mommy/daddy sad.” “There, there don’t cry.”… and the list goes on. Suppression isn’t limited to sadness, grief or anger. Often children in amazing states of joy are told to “be quiet” or “simmer down”. Emotions can also be repressed as an instinctual response to a perceived threat. Faced with a tiger, our ancestors would perish if they froze from fear. Instead, those who survived did so by repressing their fear and fleeing or fighting back. Deep within our primitive brain is a desire to repress fear and other emotions which the brain has determined could harm us if expressed. Repression can be a form of survival. The problem with repression…aside from keeping us from the whole human experience, is stuffed feelings are problematic. By not expressing the feeling as it surfaces we give it power. Stuffed tears become anxiety, anger or depression. When we suppress the energy of emotion it becomes stuck in our body. It creates physical, mental and energetic illness. So it might surprise you that I would suggest there are times to block emotions. I did this the other day. I’m sharing the story, the why and the outcome. I was at a park next to the river with a friend (a first date). We were sitting on a bench by a boat launch with a small inlet in front of us. There were several duck families hanging out on the land across the inlet about 20’ away. A mother duck and three tiny ducklings swam into the inlet from the river. I was watching them, noticing how much smaller her ducklings were than the others across from us. Suddenly there was a splash and one of the ducklings was gone. A large fish snatched the helpless little duckling taking it down into the murky water. At first I wasn’t even sure what had transpired but when it hit me, it hit me like a punch to the gut. 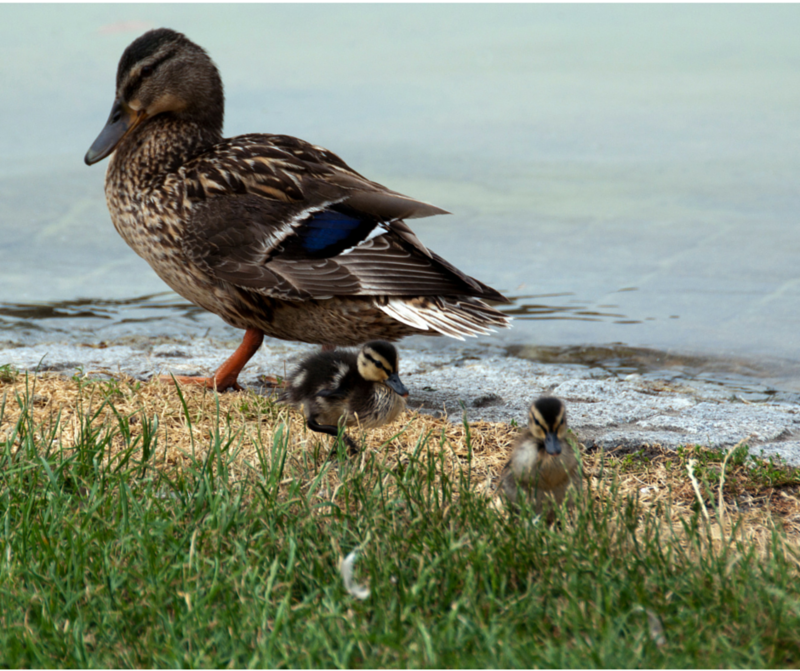 The mother duck scrambled up the rocky shoreline and was frantically trying to get her other two vulnerable ducklings to safety. The spot where she went up was too high for the tiny ducklings so she led them to a lower area so they could join her. I held my breath waiting for the ducklings to reach safety. My friend was now also aware of the mother’s plight though he didn’t know the first one had been taken under. Finally the defenseless ducklings got to a place where they could climb out and join their mother. They tucked themselves safely under her staying close. As you can imagine, this was hard to witness. Even with a deep spiritual belief about the impermanence of physical bodies yet permanence of Spirit, witnessing this part of life was too much in the moment. Kudos to my date for understanding this was hard for me (he gets brownie points for sure). And even with his understanding and a brief discussion, I knew I wasn’t in a place to allow all of what I was feeling to surface. And so I stuffed it. The next day, I found some quiet time to revisit the experience. As torturous as this seems, I went back to the memory of the duckling. This time I allowed all the feelings to surface. I stayed completely present with the experience noticing all that I was feeling physically and emotionally. I didn’t try to figure out what the attached buried emotion had been…not important. I didn’t dramatize any of it. I allowed the energy of the emotion to have all the room it needed to expand and move out of me. After about 15 minutes including tears, I felt a quiet peace. These steps are basic to processing emotions. When you’re sensitive, understanding this will make your life much easier. When we express and allow our emotions (either in the moment or soon thereafter) we reduce our anxiety, anger, depression, physical illness and pain. Do you have questions about processing emotions? Feel free to ask in the COMMENTS section below. I sure relate to what you have shared! The hard part for me is that painful emotions are so difficult to “feel”. I tend to want to get away from the pain! Even just reading your experience with the little duckling was like a sucker punch to the gut! You’re not alone. We instinctively resist feeling the painful emotions. Though when you begin to practice in little steps you retrain your system so the fear of feeling lessens. Thanks for sharing Suzanne.